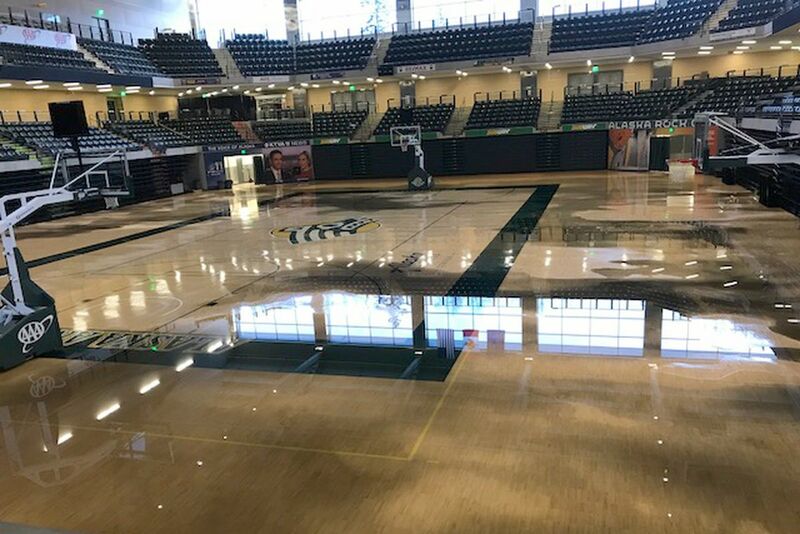 A broken sprinkler system left standing water on the main gymnasium at the Alaska Airlines Center in the aftermath of Friday’s earthquake, but whether it leaves long-term damage isn’t known yet, the UAA athletic director said. “I’m a little anxious because there’s been no assessment yet,” said Greg Myford, the head of the university’s athletic department. “We’ll make sure all the water is up and get some blowers in there” and then have the floor inspected, he said. Some of the glass panels on the arena’s trophy cases shattered, and some of the trophies are “a-kilter,” Myford said. At the Wells Fargo Sports Complex, a broken water pipe sprayed water from the ceiling onto the running track near the ice rink where the hockey team practices. No one was injured at either facility, Myford said. Both of UAA’s basketball teams are playing on the road this week. The men’s team, which plays in Billings, Montana, on Saturday, reported on Twitter that its flight out of Anchorage departed five minutes before the 7.0-magnitude quake struck. At Dimond High, where ceiling tiles fell and floors were covered by books and debris, Friday’s matches at a pair of state volleyball tournaments were postponed. Competition will resume Saturday at Anchorage Christian School, said Billy Strickland, the executive director of the Alaska School Activities Association. The move to ACS, a private school, was necessitated because all Anchorage School District schools are closed until Wednesday. In order to squeeze two days' worth of action into one day, matches will be best of three rather than best of five, other than the championship match. Consolation-bracket matches will consist of a single set to 30 points. “We want to do everything possible to finish the tournament,” Strickland said. Twenty teams, many from rural Alaska, are in Anchorage for the three-day Class 2A and Mix Six state tournaments, which began Thursday.